The German Solar Heating Initiative has put together a crowdfunding project to fund a consumer campaign called Heat Changers. 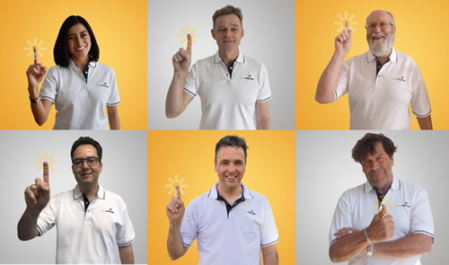 Its initiators, Marisol Oropeza and Stefan Abrecht (first and second image from top left), have already brought some well-known supporters on board, including Markus Elsässer, Founder and Managing Director of Solar Promotion and organiser of the Intersolar Europe (bottom left), and Australian Ken Guthrie, formerly chair of the IEA Solar Heating and Cooling Programme (top right). The funding deadline for the EUR 35,000 project on kickstarter.com is 19 July 2018. The money is intended to be used for a six-month solar heat promotion campaign via social media, a website and other online tools. “We, as Heat Changers, are passionate about solar heat. But, it is not enough to explain the technical details of solar heating and compare them to other technologies. We know that all decisions are emotional, and people will be motivated to learn more about solar heating if they see and hear that it works and is profitable,” Abrecht said. The six-month campaign will target consumers in three languages, namely English, German and Spanish. It will address their concerns on an emotional level but also provide information about reliability and system economics. It will start once the EUR 35,000 goal is reached. The two initiators have entered into collaboration with designers and social media experts from around the globe. “We want to draw consumers’ attention to the amount of heat they need and, more importantly, to highlight that they can become Heat Changers and use solar heat to do something against climate change,” Oropeza said. The backbone of the Heat Changers campaign will be people who have been making use of solar thermal technologies and are willing to share their stories to motivate others to start doing the same. “Today’s online tools and channels represent a huge opportunity to spread messages worldwide in an easy and more cost-effective way than by using traditional media. The challenge is to create content that is more appealing to consumers, so it grabs their attention and increases their willingness to share experiences,” Oropeza said. She has been marketing solar heating around the globe for more than 10 years, having worked in the industry for a long time before becoming an independent consultant two years ago. The Heat Changers project is available on the crowdfunding platform kickstarter.com to offer people a chance to contribute. All anyone needs to do is to provide their contact and credit card information. The credit card will only be charged if the funding goal is reached. By 4 July, as many as 27 supporters had pledged EUR 5,347.